Description: Sandhouse, coal tower and water cistern all loom large over the diesel locomotives that swept away the steam locomotives. Description: Track crew working on the xing step back for westbound BOEL in Chatham. Description: BOEL westbound at MP 161. This location is very near the West Stockbridge/Richmond town line. Description: SENH at Muitzeskill Road with the same lash-up that brought BOEL to Selkirk, earlier. Description: SENH coming up on the Sleepy Hollow Road overhead in Richmond. Description: CR SD40-2 #6428 & SD40 #3226 on OIBU westbound at JA Cabin, Lanesboro, Pa. coming off Starrucca Viaduct. Description: With Lebanon cityscape in the background. Photo taken from my old office in the ex-Union Boiler Works. Description: Conrail SD40-2's 6490 & 6428 lead ALSR (Allentown - Hagerstown) manifest through Lebanon, PA @ 12th street. Kodachrome by C. Hash. Description: Shiny new 562 rests in the power pit at Stanley Yard. CR 6428 waits with her. Description: No not the SD60I, which was almost new then. The semaphore, which has been in place there since the 20s. It will soon fall, as Conrail will single track the line from Elmira to Waverly later in the year. The train is BUAL, a road freight originating at Frontier Yard in Buffalo, terminating in Allentown after a trip down the ex LV via Towanda and Wilkes Barre, and the Lehigh Gorge. 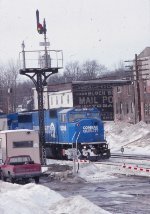 Conrail alternated their approach on this train, as it changed its western origin several times over the years, most often running out of Gang Mills. Today's effort takes 128 cars east, and is about to take the connecting track to reach the ex LV at Sayre. Description: ML 401 was a reliable late morning to mid day train on the Tier. Todays train is heading around the big curve west of Campville with 108 racks as the chase gets underway. Description: By Chemung what snow there was seems to have disappeared. Still, this is a great location looking from the NY 427 overpass. Description: ML 401 crosses the Chemung River at Elmira with a little ice along the islands to remind us its cold out there. Description: One of my favorite spots was the shot in downtown Waverly, where the buildings make the shot. Heres ML 401 passing through. Description: A northbound freight passes former COLA tower. action on the Port road is mainly at night because of Amtrak restricion on the NEC. Description: A couple of CSX units, along with a Conrail SD40-2, wait at tha north end of CSX Osborn Yard to head north on a beautiful summer day. Wish I would have gotten a better picture of the Conrail unit! !